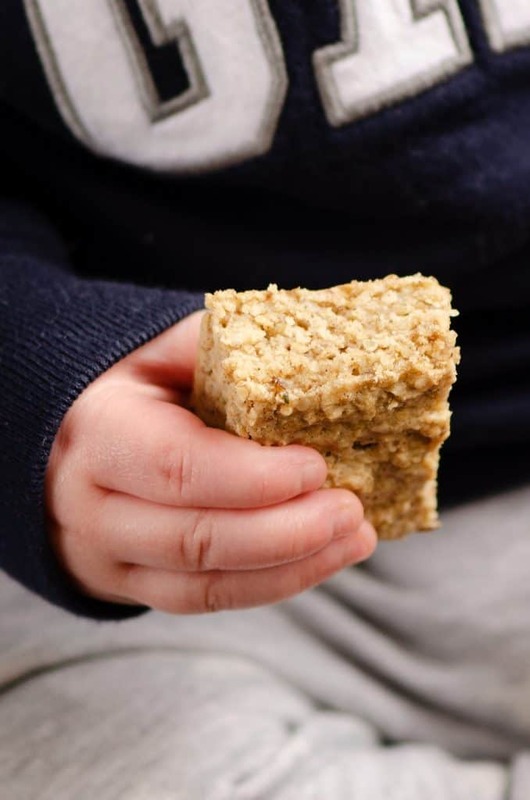 Kids No Sugar Peanut Butter Banana Oatmeal Bars are a healthy and easy sugar free kid friendly recipe perfect for your BLW babies and toddlers! 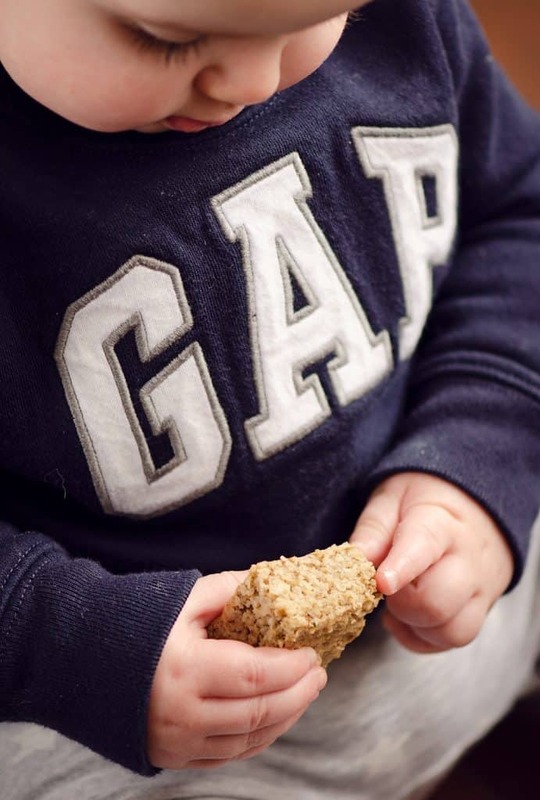 I have talked a little bit about the fact that we did Baby Led Weaning (BLW) with our twin one year olds. We started them on solids around 7-8 months when they showed all signs of readiness, letting them feed themselves and explore the flavors and textures of food beyond just purees. There are so many benefits to this way of eating, including the fact that you can serve them what you are eating and don’t have to make special meals just for your kids. With that said, I don’t want my kids eating added sugars before the age of two. I know some people think that is too rigid, but I want to set them up with the healthiest eating habits possible. 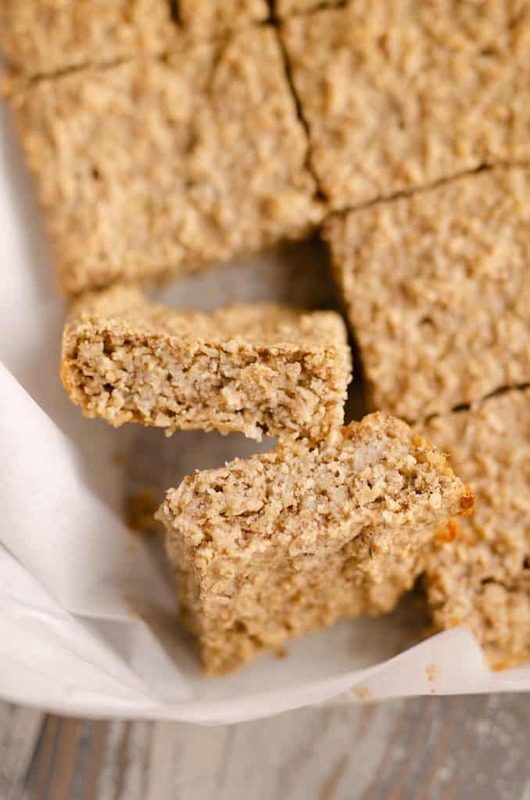 Therefore they won’t be eating the sweets that we like to enjoy like Chocolate Chip Cookies unless Grandma and Grandpa sneak it to them, but instead will be enjoying treats like these Kids No Sugar Peanut Butter Banana Oatmeal Bars. 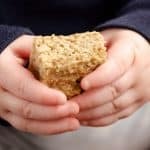 I wanted to whip up a simple granola bar or bar recipe for the kids that I could use for breakfast or snacks that didn’t have any sugar in it. I set out on an internet search for a quick fix. The problem with searching for sugar free recipes is that people use that as a buzzword while sharing recipes that are full of sugar…just not granulated sugar. Honey, molasses, coconut sugar, etc. are all still SUGAR at the end of the day. While they are healthier forms of sugar, they aren’t actually healthy at the end of the day. I finally came across a good recipe from Mama Knows Nutrition that didn’t have ANY added sugars in it. I made a couple changes to her recipe like adding peanut butter into the mix to appeal more to my children. Now before you call me out on it, I known that peanut butter does have a little added sugar in it. The amount of sugar that it adds to this recipe is less than a 1/4 gram per serving though, so we are still going to stick with the idea that these are a no sugar added recipe. 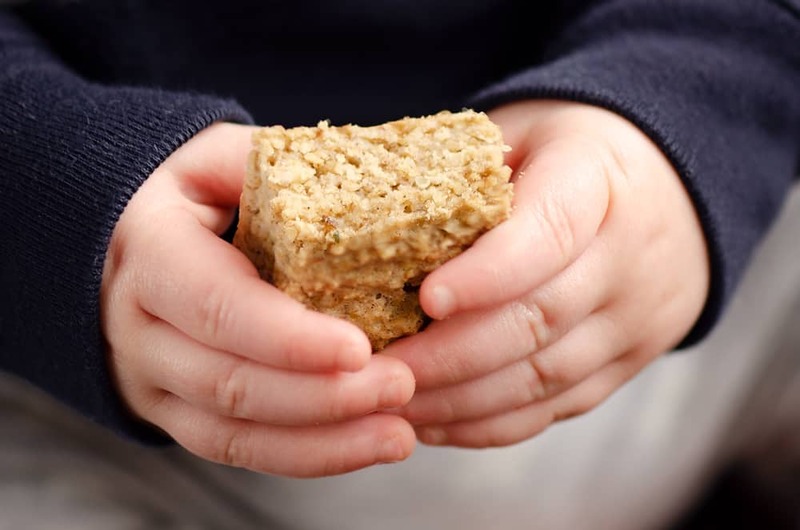 Let me be very clear about these Kids No Sugar Peanut Butter Banana Oatmeal Bars, they are intended for children who are not used to eating sugar. If you take a bite of these, you will very quickly understand why. To put it simply, they are bland. 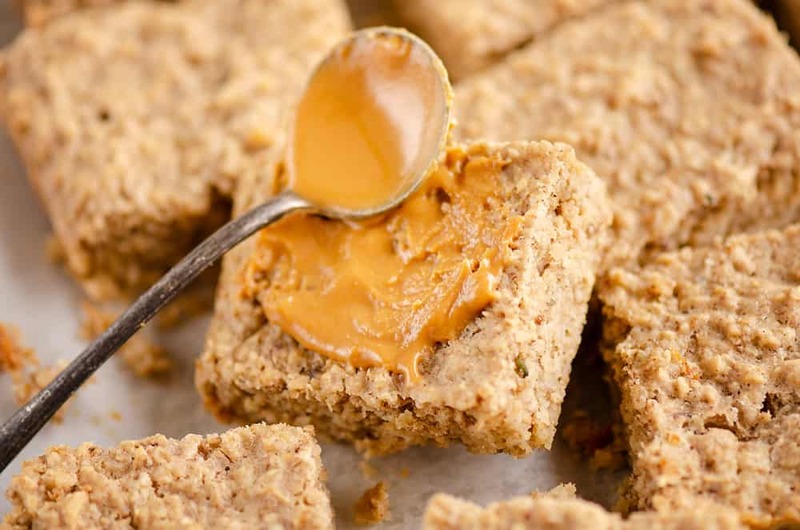 There is virtually no sugar or sodium in this recipe because it is a healthy wholesome snack for kids and they don’t need all that stuff that us adults like to enjoy. To be honest, we don’t need it either, but most of us have trained our pallets to want it. 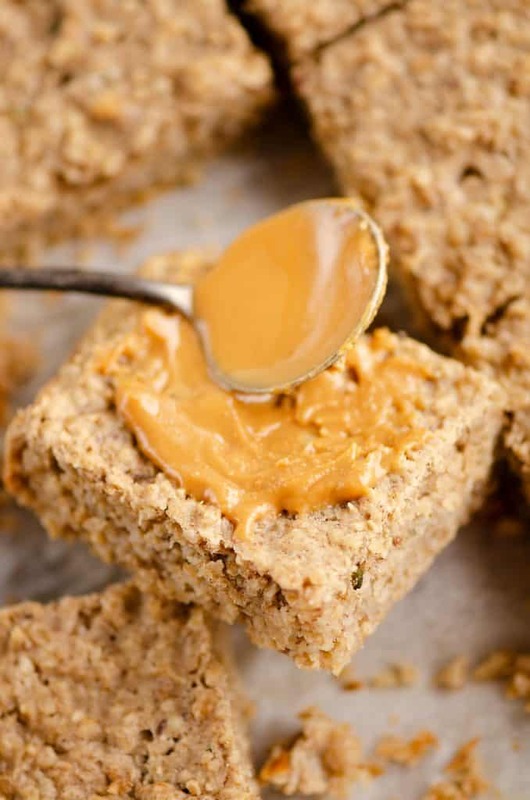 I ate small bar smeared with lots of extra peanut butter and it was a good filling snack for me, but it’s nothing I would go back for seconds with. 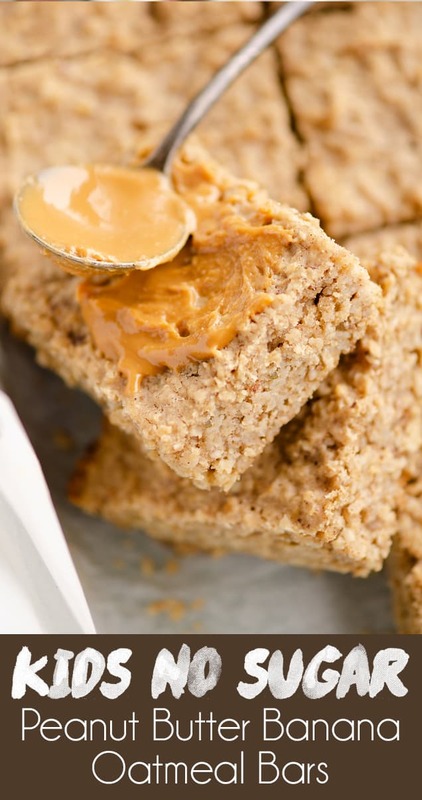 The first time I made these Kids No Sugar Peanut Butter Banana Oatmeal Bars, I handed a piece to my 11 month old son and he LOVED it! He gobbled it up in no time during snack time. Not only does this recipe not add in any sugar, it is also gluten-free which is a plus for anyone with who has an intolerance. Peanut butter is a high allergen that you will want to be mindful of when first serving to make sure your kids don’t have a reaction. We introduced our children to peanut butter at 7 months per newer recommendations to introduce high allergen foods as soon as possible. It has actually been shown to reduce allergies by exposing kids earlier in childhood. Just keep in mind that allergic reactions can happen the first time or 50th time you introduce a food to your child and that this pertains to children who don’t have a family history of allergies. 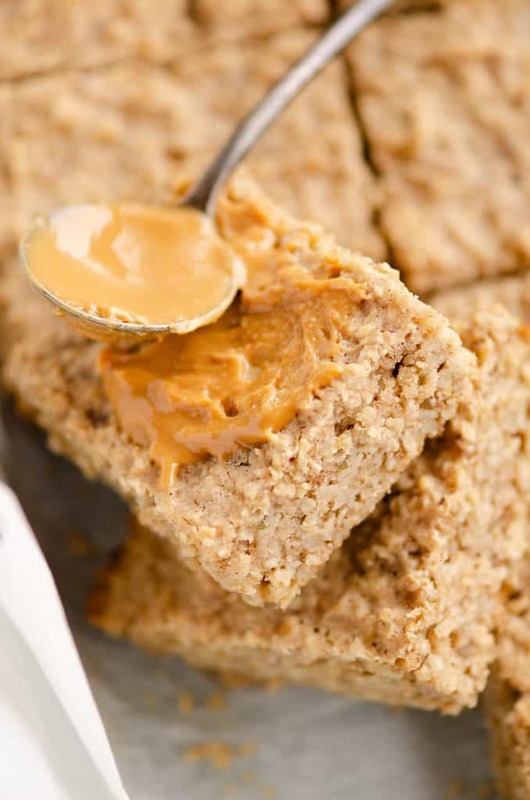 Kids No Sugar Peanut Butter Banana Oatmeal Bars make a big batch of 24 servings. Even with twins, this was more than I needed over the course of a week. The best part of these bars is that you can freeze them for easy snack prep. Refrigerate the bars you will be using over the course of the next 5 days and pop the rest of the bars in a freezer bag and store them up to a couple months. Pull out a few bars each week for a quick and easy snack for your kids. If you want the bars to last even longer, individually wrap each bar. This will keep them from spoiling in the freezer for at least a few months. Add one cup of the oats to a food processor and blend until a flour consistency. Set aside. Add the coconut oil to a large bowl and microwave for 30 seconds. Add the banana to the bowl and mash using a fork or potato masher. Add the apple sauce, peanut butter, vanilla, eggs and milk to the bowl. Mix until well combined. Add the oatmeal flour, oats, cinnamon, baking powder, flax and hemp seeds to the bowl. Stir well to combine. Line an 8x10 pan with parchment paper or spray it with non-stick spray. Add the batter to the pan and bake at 350° for 30-35 minutes, or until the center is set. Slice and store refrigerated for up to 5 days or frozen in an airtight container for 2 months. Great homemade snacks to make! So much healthier than store bought. Great snack for the kids! Such a great healthy snack for my grandkids! Would these freeze ok? I seriously need to give it a try! Looks perfect for my kids! I am always on the hunt for new healthy snack ideas to give my kids and these turned out so well!! Thank you! !